To conclude this unit student will reflect on the work they have done and the work of their classmates. Students will build their visual language and critical thinking skills while participating in a class critique of the commentary artworks created. Students will work together to present their work for exhibition. Students will articulate their intentions as the artist through the creation of an artist statement to be displayed with their artwork. 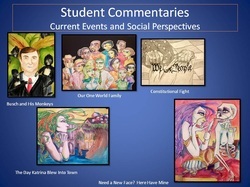 Students will have the opportunity to demonstrate their understanding of documentary and commentary artwork, artists, and purposes for art creation through an end of unit test.through the completion of a test. Artists create to illustrate individual and collective view points. Art can raise awareness to social and political issues. Art can instigate change in personal and public arenas. Artists have a role in documenting and shaping society. What are the social issues in contemporary society? How can artists use their art to make comments on social issues? How can artists use their art to bring about social change? What role does the artist play in shaping society? Present and display works of art as part of the artistic process. Be an active participant in a class critique of the artworks created. Reflect on what inspired and influenced them in their commentary artwork creation. Evaluate their art, and the art of others, as to its effectiveness in making a comment on a contemporary social or personal issue. Articulate their understanding of contemporary social commentary art, their intentions and the effectiveness of their own artwork through a written self critique. Students will articulate their intentions as the artist through the creation of an artist statement to be displayed with their artwork. Students will have the opportunity to demonstrate their understanding of documentary and commentary artwork, artists, and purposes for art creation through an end of unit test. Students will write an artist statement to be displayed with their artwork. Students will work together to install an exhibition of their artwork. Students will participate in a class critique of all the artworks. Students will write a reflection on their artwork that will answer the following questions. * Why did you choose this issue to create an artwork about? * What are you trying to communicate through your artwork? * Do you think your message has been communicated effectively through your artwork? Why or why not? * Explain what artworks, artists or knowledge gained through your research influenced your art making process and final artwork. Students will complete an end of unit test. The test will contain teacher and student created questions. Formative assessments may be utilized as the teacher observes student participation and contributions to the class critique and installation of art for exhibition. Evaluation of the quality of the artist statement and written reflection. Students should be given the grading rubric for both the artist statement and written reflections prior to beginning those processes. 5. completing a self-evaluation of the exhibition. AIV.17 The student will justify personal choices and the influences from art history that are reflected in personal works of art. AIV.18 The student will discuss how the function and intended meaning of personal work is a reflection of contemporary culture. AIV.20 The student will use an extensive, high-level art vocabulary related to design, composition, aesthetic concepts, and art criticism when discussing works of art. AIV.22 The student will write a personal critique of a current art exhibition. AIV.23 The student will identify, analyze, and apply a variety of criteria for making visual judgments. AIV.24 The student will demonstrate the ability to conduct an effective critique. AIV.29 The student will study, analyze, interpret, and relate the aesthetic qualities of the art works of others to personal work. AIV.30 The student will justify personal perceptions of an artist’s intent, using visual clues and research. AIV.31 The student will discuss in writing the impact of contemporary art on the development of a personal style.